My Life is an Open Book pins a mix of autobiographical narratives to the walls of the Regenstein’s Special Collections Resource Center. At the intersection of the ultra-personal and the act of artistic creation is the zine—a new face of poetic storytelling that is fundamentally visual, and as much concerned with process as final product. Emerging first in the ’70s as an offshoot of the underground punk scene, zines’s popularity flared up again in the ’90s, mostly due to young feminist artists within the punk rock subculture. As the diversity of content within the exhibit suggests, zines come in a wide variety of appearances and genres: From the playful to the political, the fantastic to the everyday, there is no true topical parameter for these pocket-sized artworks. To enter the exhibit “My Life is an Open Book: DIY Autobiography,” you go through the first set of doors on the left en route to Mansueto. A set of glass tables reveals a brief historical context to the life of zines (including, bless the Special Collections Research Center, a centuries-old text that is apparently the prototype for modern-day zines). Also featured inside the second case, and providing a nice contrast to this historically saturated relic, is a sort of meta-zine. “The Best Game Ever (because it’s about zines),” produced locally in 2012 by authors Billy the Bunny and AJ Hermz, is a multi-part text that presents itself as a stack of playing cards. In addition to the energetic roughness of its general aesthetic, the text is conceptually adventurous as well: It experiments with and puts pressure on the already-formed clichés of zines and zine-making, framing these tropes in the locus of a board game–like narrative. Phrases like “political rant” and “caught stealing copies” are paired with point values to indicate their relative value and desirability in the zine world. The busted copy thievery sets you back 100 points in this hypothetical game, while political rant clocks in at +5/-5 (“Worth -5 if more than 1 ‘political rant’ is used in the same zine.” Another card makes a reference to the internet subculture and counterculture’s ongoing joke of Nicolas Cage hate on a “top 5 totally worst things ever” list: Cage is number four, world hunger is three, and second-place mass murder is only beat by your “poorly done collage” (-10 points)—yikes. It must be pretty awful. 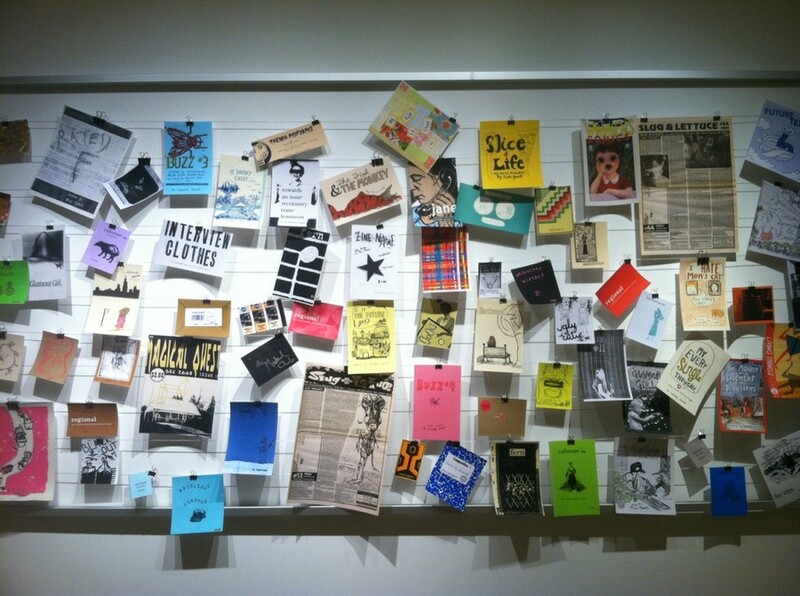 Above the encased zines sits a text panel that is immensely helpful in gauging what, exactly, counts as a zine. Among the characteristics that form the backbone of “zine theory”: The zine must be self-published, self-produced, and self-distributed. There is also a more ideological requirement, that the zine must be directed at an explicit audience (oneself is A-OK). Most importantly, the zine may not present itself as a piece of artwork. The need for zines to subvert any sort of capitalistic mode of production and distribution is fundamental to their concept. The wall opposite displays an assortment of zine cover pages pegged to a mounted frame made up of about a dozen horizontal wire strings. A panel to the left reveals the “best” designs and any coloring as typically reserved to the cover of the zine, due to the expense of color ink combined with the not-for-profit aspect of zines. The cover pages displayed indicate a desire and tendency to put pressure on traditional limitations of 2-D media: Many of the covers, rather than featuring original artwork by their authors, instead make use of found objects. Objects used include a composition notebook, an assemblage of three CTA passes, and, perhaps the most unique, “An Examination of American Cuisine” (Issue I, spring 2011) by Cassie Tompkins, is wrapped in a cover of a weighted deli package. If zine covers have one unifying factor, it is their disunity: From bursts of color to monochromatic, minimalist designs, from original illustrations to found material, used and reused, singular and combined—each story’s exterior hints at the diversity of the content within. The next two cases focus on the works and histories of two Chicago-based feminist zinesters: Marion Runk and Corinne Mucha. Runk’s feature appears first; the fantastical nature of her artwork, infused with dark comedy, is immediately apparent. Mucha’s work is similarly suggestive of magical realism, but is more direct and autobiographic in its emotional severity (though not without a good sense of humor). Mucha suggests that she is less interested in the confessional allowance of autobiographic texts and is more compelled by the ability to reclaim those personal (hi)stories through the process of writing them. As the exhibit nears its end, the focus expands back out to re-address the range of topics and concepts tackled by zines at large. The last couple cases characterize zines as a constructed, sympathetic space for discussion of and experimentation with social and personal issues on both a micro and macro scale: body issues, gender identity, family ties, and censorship are presented, among other themes. The final case deconstructs the assumed temporality of zines as a singular, immediate, and self-contained narrative. Zine series undergo change as their authors change, which suggests that the autographics possess a certain livelihood and corporeality typically inaccessible to written works. The stories behave as symbolic extensions of their creators, and they are, in many senses, authors of their own histories, telling and living, all at once.